Ganking update: we did some serious ganking yesterday, post about it on Saturday. A new kind of naysaying appeared on the Undergeared posts and forums discussing it. While "Festergut/BQL/Putricide is impossible" type naysaying became sporadic (maybe they afraid we kite them to Grok Scourgebane or something), they obviously not about to give up attacking the project. The new kind of criticism claims that the content we do is "irrelevant" and by the time we kill the Lich King, he will be irrelevant too. I guess "irrelevant" means that clearing SWP would be quite easy for a 25-man 5K+ GS group and no one would accept this kill an "SWP clear". 47211 guilds downed Rotface. So there are already 5K guilds who were unable to do the content Undergeared did. The fact that there are guilds in ilvl 245+ gear (badge rain guarantees it) who performs worse than a blue geared group is shocking on it's own. Only 17645 guilds downed the Lich King. And 15K downed Marrowgar HC. So the WotLK normal content is not "complete" for majority of the raiders. We are not just doing some "old content", we are doing the same content what majority of the raiding guilds. But the really shocking data is the "Lord Marrowgar (10): 52184 (92.66%)". What is 100%? 56318 guilds! Since Wowprogress covers Europe and the US, about 4M players are in it. Even if we assume 15 man for every 10-man raid (sit-outs, replacements), we get only 850K players as "100%". Where are the other 3.2M? Don't say that WoWprogress is inaccurate, our guild is mentioned, just like all the "friendly socials guilds" I know in Arathor. Hey, even the ganking guild is up! Out of 4M players, only 850K are capable to do any kind of raiding. The rest are in "fun" guilds where they farm gear for nothing. Or they are non-raiding "friends and family" in raiding guilds. Killing only Marrowgar gets you in the top 25%! Undergeared is in top 20%. Is this irrelevant? People in the top 1% often believe that the whole community is equal to their visible competitors. A 11/12HM raider thinks that everyone downed LK normal, and the "n00bs" are the people who can't do Saurfang HM. No, if you downed the LK normal you are already in top 7%. This is a serious mistake and lead to the failure of many attempts to "fix the society". They try to apply some "cure" that made them top1% out of the top10%. However the line is not between top 1% and top10%. The line is between those who are in the competition and those who are not. Undergeared is in. We, simply by our pure existence and the fact that we downed something in ICC are among the competitors, among those who do current content. The line is not between 7 figures CEOs and 30K blue collars. The line is between the 15K blue collars and the welfare leech. This is also the answer why I do Undergeared instead of hard modes in normal gear. Because - exactly due to its rarity - the hard mode raiding is not relevant for the "average player". Their exploits are rejected on the basis of "no lifers farming 6 days a week". If you want to affect the people in general, you can't just withdraw to some ivory tower. I (exactly because I belong to the top 20%) know that the HM raiders are not no lifers and their results are mostly because of superior skill. But the "common people", the non-raiding masses of WoW who demand 5.5K for Sartharion weekly and votekick a tank from UP HC for having "only" 35K unbuffed do not, and will never. To have an effect, you have to beat them in their own playground. I don't think that comparison holds, since in pretty much every server you can be unguilded and PuG 4/12 or 6/12 content. So I guess the percentage that did Marrowgar is much higher. On every server there are PuGs. But they all demand achie and gearscore, so they are open only to those who did it already. Mostly guilded people who did not get spot or whose guild disbanded. Forget the haters. I'm really fascinated by what you guys are doing. I do a weekly podcast with a friend every Monday and we're going to be talking about gear scores next week. I plan to talk about Undergeared in the whole GS argument because, obviously, GS is NOT everything. I did my first 5-man in over a year. I also had never grouped up as dps before, I was tank for over three years. I came into the group after it had already started, my new interface has a couple of bugs and I was missing half my dps buttons for several pulls, and I hardly knew what buttons to use in a group to begin with. Yet, when someone posted the dps stats after the run, I saw that I had out-damaged someone. It might have been the healer or the tank but I was rather proud none the less. I mean, after all of my screw-ups, I still managed to do my job. In crafted blues. I do not think that reflects any real skill on my part, but rather the lack of skill of the others. There is no good reason why I should have out-damaged anyone on that run. You are proud to out-damage the healer??? Btw, as a priest healer I can pull out some nice dps numbers (e.g. 4k on bosses, 2.5k on trash) whilst healing if I have a geared tank. But I know that other healers with less offence (e.g. pallies) won't be able to put out these sort of numbers. The stats for WoW progress on smaller guilds is horribly outdated, if not non-existent in some cases. In some cases we formed 'PuGs' and done up to, and including, Sindragosa. Yet I can't find a number of the players, including mine, at all on WoWprogress. Isalvage on Suramar for example. I use PuG loosely because it's generally 7 or 8 of us from various small guilds and we pick up others through trade. If WoWprogress collected data automatically it wouldn't really need an Add Guild function. Did you read how badly I screwed up? For at least half of the run (that I was there for) I was just staring around wondering what I should do next. Doesn't everyone outgear all the instances at this point? Isn't that what all the bloggers are writing about? My point was simply that as bad as I was, I still managed to what dps is supposed to do. With a lousy gearscore, first time in group in over a year, first time as dps in a group, missing half of my utlities for a portion of the run, and missing some of the run to begin with. That is really bad. And I do not believe for a moment that I should have out-damaged ANYONE under those circumstances. I should have been kicked out or at least cussed at. Keep in mind, as far as WoWProgress goes, guilds that have disbanded/ceased to exist are still counted a year or more later. @last anonymous: I agree that the best data would be personal achievement census. But we must work from what we have. Also, disbanded guilds couldn't down Marrowgar. So if all else is debatable, there ARE 5K normal gearead guilds who did raid marrowgar but failed in content Undergeared succeeded. Please mind that there are many many guild who have more than one 10 man teams. For example my guild has four 10 man teams which means around 50 people. Two of those teams are now running heroic mod and the 2 other are mostly with social players who have still killed at least the Professor. I am quite sure my guild is not the only one that does multiple team raids on 10 man and WoW Progress doesn't take that into account. I'm not in a guild since Ulduar, so I really didn't had any achi when ToC or when ICC come. Despite that I have 2 "mains", both have almost (normal. not hc) BiS gear from ICC25 (and killed 9/12), only by doing pugs. You can really easily get in a group without any achi or high-end GS. Of course its harder now, but when a new raid comes, many people dont have it, so there are many groups who dont require it, and you can get it without any guild. I had my first icc10 run without any achi, and 4,6k gs with my healer (and no, I didn't use the fake-achi addon). As they use to say, its The Wrath of the Casual King. Guild statistics doesn't say anything now, when you want to see anything below the top-end. I know it's not irrelevant. I showed your achievement to my 24/7 wow-playing sibling in 5k GS, and he couldn't accept it was possible, even watching the video and saying you had to be cheating. So while M&S players continue to be M&S, achievements like this continue to be relevant. Well, I'm sure that even a 900 DPS spellpower wearing DK can out-dps a healer who may be doing nothing but healing. The dps meter at the end of the run could be linked because your party members could be having a chuckle at your dps. I'm sure they will get a kick if they hear you say that you're PROUD to out-dps a healer. I don't understand your logic - just because you weren't kicked or called out it was really bad? I mean, it is even worth wasting time to call out people? I don't see it as my civic duty to help people improve - I only want to finish the dungeon asap. Also, the last time I checked, patch 3.3.5 hasn't been deployed yet and the kicking cd still exists. I don't disagree that we often overestimate how far the average player has progressed. Even if you see quite a lot of Kingslayer titles around, they're still not somthing that *everyone* has. What you need to bare in mind though when you do those kind of calculations is that not every player is interested in raiding. At all. There are those who skip end game and devote their entire game time to level new characters and start over once they reach 80. Others only go for PvP. yet others are into role playing. And then there are all those PvE players who never do anything more advanced than 5-mans. I wonder if we ever will get the full picture. How many players spend most of their online-time raiding and have it as their major interest in the game? If we could identify this group and go from there, calculating how many percent that have downed boss x, we'd come a bit further in the discussions. Anyway: I really like your approach. You've definitely stepped down from the ivory tower in a way that very few do, trying to spread enlightment and inspiration to the masses. Way to go. I find it really hard to believe that taking down Marrowgar will make a player in the top 25%. Gevlon has estimated the number of players as 4M. Whilst the number is accurate, how many of this 4M are lvl 80 raiding players? For the comparisons to be valid, we need to found out the number of raiders who actually want to raid and the proportion who have actually cleared Marrowgar. Right now, the average raider is probably 6/12. I don't have a scientific backing for this, but I can guage this by the achievements requested by trade pugs. So, for them, killing Festergut + Rotface is no real big deal. When the buff was at 0%, many people were struggling on Rotface and Festergut. Imagine the impact the Undergeared would have if they cleared them in blues? @Azzur: most of them not being raiding players is the point. I'm saying exactly that simply killing Marrowgar place you to an "elite" (which is bizarre, but true). While most people who don't raid claim they don't want, it's never-ever true except for players who leave WoW itself recognizing it's not the game for them. While I think smashing stuff in blue gear is to be applauded, the numbers are pretty skewed. The 'retards' unable to down Marrowgar include a pretty large number of non-raiding alts. As for further progression, these alts down less and less of the content compared to well progressed main characters. At the other hand -- I shudder at the memory of some of the retards who DID indeed 'down' bosses in ICC. They're usually doing this face down from ten to fifteen seconds into the fight -- EVERY fight. While I won't say that WOWProgress is inaccurate, I can tell you that my guild is not listed, and most of our raiders have cleared 8/12 in 10-man and 6/12 in 25-man. Our guild site states that it was founded in Feb 2005, too, so it isn't a newly-formed guild. This may be a rare occurrence, or it may be more prevalent than you had assumed. Since I don't have any actual facts, I don't know which is more true than the other. But I don't think doing a case study of your own server can provide enough evidence for you to specify exactly how accurate WOWProgress is, either. This is incredibly insightful and applies to just about any community, in gaming or IRL. I haven't played Wow for over 4 months. Before i stopped I completed 'Storming the citadel' on 5 different toons in pugs. Of those toons, only two are (were?) guilded - both in different guilds. 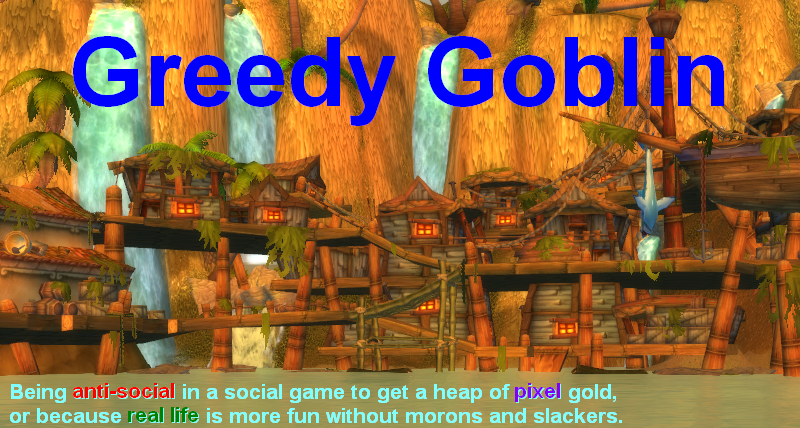 One of which is the toon's own guild. Your data may be skewed in ways you might not have thought of. But the overall point is quite valid. I still laugh at all these preteen kiddies who think that gearscore is the end all number/benchmark for skill. And every single time I point them to this blog, they become hostile if I just mention people doing VOA Toravon or ICC first quarter in BLUE gear. Most of these "5kgs or no invite" asshats have to feel better about "I have an awesome GS I am the best" and get pissed of that people in lower gear(Undergeared)get to finish content they can't. Keep up the good work Gevlon, oh and funny comment on Noisyrogue's blog. "Don't say that WoWprogress is inaccurate"
One of my raiding guilds isn't listed at all. The other has data which is out-of-date by nearly two months. WoWprogress is inaccurate. Well, I used the same math a while back. I downed Sindragosa normal the week before the 5% buff was brought to servers. Apparently, that was enough to make me top 3% of raiders. To the 'GS isn't skill QQ' people. GS is a metric for evaluating PuGs. We're talking about guilds here. GS has nothing to do with guild progress. Until you muppets will realize that the purpose of PuGs is not 'progress' but 'faceroll content for epix', then I fear what Undergeared does will be misinterpreted as some kind of magical point supporting this retarded argument. Well it's not. Every sane raidleader assumes everyone who joins his PuG is a moron, therefore demands gear to compensate. I'm rather certain Gevlon doesn't assume that of his guild. websites that track kills, don't count individual achievements, they only count a kill that was made with majority of the guild in a group when it occurred. Therefore if you belong to a guild that doesn't raid together, even if majority of you cleared pretty far into ICC at various times, as a guild you will have no ICC rating. The content is relevant as long as its challenging. Otherwise there wouldn't be people seeing just how far they can solo, people pushing the limits of their characters in various ways. "Most of these "5kgs or no invite" asshats have to feel better about "I have an awesome GS I am the best" and get pissed of that people in lower gear(Undergeared)get to finish content they can't." Undergeared is not to be used a way to say "LOL GEARSCORE IS TEH SUX". Gevlon is not pugging. He's found competent people to raid with. As a PuG raid leader I assume that every person I invite is a complete drooling moron even if they have a high GS, the achievement, ect. PuG raid leaders like me know that a high GS is no guarantee that you're any good at your role. But we do know that better gear gives us higher chances of success. This is rational thinking. If you're still angry because you keep getting rejected by PuGs than you have to options: start your own raids or join a guild. you claim at most 15 players/guild for 10 man raiding... that is with very high probability too low, not cause you "need" more players for 10 man raiding, but cause you need more for 25 man raiding/fun/whatever. This means, that lots of guilds may have more than one 10 man raid (seeing the HC guilds with maybe 4 to 6 10 man raids (mains + alt raids to gear up). Gevlon, "While most people who don't raid claim they don't want, it's never-ever true except for players who leave WoW itself recognizing it's not the game for them." is one of the more ignorant things you have ever said and is surprising coming from the same guy who ran solo/duo lowbie dungeons just to see if he could do it. There are a variety of ways to play the game which do not involve raiding. Leveling, arena, ganking project, rp, pvp, 5man only, ah baron. Many many people play the game in these ways and do not raid and have been for a long long time. My own anecdotal example is my playing partner who has had an active subscription to WoW since a few months after the EU launch and has only ever been in a single raid, a Kara raid which cleared 4 bosses with no wipes and stopped. he had 3 level 60s pre-TBC, 4 level 70s pre-Wrath and is working on his 5th 80 now. he has done a smattering of 5mans at each plateau, never heroics, has held a 1700 arena rating with mostly BG gear and makes money on the AH with ease. and no, this is not because he is a social. he has never been in a guild and his only wow friend is me. raiding isn't the end-all be-all of wow life. you should know that. @Holger: Paragon doing 6 10 mans for various ALTS does not mean more players. I accept that 25 man guilds probably have 30-35 players who did 10 man. Wowprogress says 42160 (74.86%) guilds for marrowgar 25. The 100% is 56316 what conspicously matches the 56318 guilds for 10 man. But even if we multiply 56K with 30 we get 1.6M, so 2.4M still don't raid. Also, the players in 10 man guilds who don't raid belong to the point. They are socials tagging along and less progressed than Undergeared. I remember a thread on the official forums where someone kept arguing that someone who has not beaten 10 man normal LK should not be considered a 'raider'. It gave me a good chuckle on how narrow some people are in their view of the world. My guild is currently 7/12 normal 10 man and will probably kill the princes this week for the first time. We know we are not that far 'progressed' as the standards of elite raiders go and compared to the Undergeared people we are not that skilled raiders. However, we are improving each week and we keep on progressing. We might start a new fight completely clueless but will keep wiping till we learn what do to and figure out the 'rhythm' of a fight. For someone like us, the ICC 10 man normal content is quite relevant. It gives us the chance to learn and progress while having a lot of fun doing so. Lot of people have this mentality that if you cannot be the best, then your efforts are wasted but sane people recognize that in the end it matters more how well you personally improve rather than whether your are #1. While I never drove a racing car, I'm worse than Michael Schumacher, just because I never did it. While one can argue that potential skill exists in me too, one can be sure that I'm worse than him. However, the comparison is a bit flawed. If I said that Michael Schumacher is the best race driver (just for the sake of argument, he's rather old and not that good right now) from 6 billion people, I'd get raised eyebrows. It doesn't tell much to compare Michael Shumacher to say... Bill Gates, and say Michael Shumacher is better. This is why, I think, it's better to compare him to other race drivers. The argument is stronger. Now it's even funnier when I see people post in the WOW forums about how the game has become too dumbed down because any casual can kill the Lich King. Chances are that the person doing the complaining hasn't even made it past Festergut. Heh. I think your naysayers seriously need to re-evaluate how they spend their time. They have NOTHING better to do than to actually go to a forum of a project they think will fail and come up with excuse after excuse as to why it's not worthwhile? If ever there was a picture of a "loser" on the internet? It's those kinds of people. As to the content being "irrelevant"? They are grasping at straws, and I don't even think it was worth your time to dignify them with a response. What, exactly, would they consider "relevant" content, if not the content that is the gateway TO the Lich King? Your naysayers are getting more ridiculous as the sand under their feet washes away. Keep up the good work and more importantly: If you're having fun, f*** the haters. They aren't participating, so why are they crying about it anyway? @hound: Welcome back to group content - but please please help beat down the idea that "everyone outgears instances now". A baby alt dies every time someone says this. At least, until they let me use the nearly 300? triumph badges my main has.... to gear up my alt. I'm a healer (holy paladin) and when I'm actually healing I only do like 100 DPS (because I need to judge every so often) throughout the run. I would think that WoWprogress' data is not 100.00% accurate, but certainly it's in the 'decent' range... pretty much every active guild seems to be in there. On my Server, US Kul Tiras, they report that there are only 5 guilds that have cleared the Lich King on 25 man, and only 17 that have cleared him in 10 man. Only 91 guilds are even listed in the 10 man race, 75 guilds in the 25 man. And, as you'd expect... it's the same guilds doing both. Why is this data accurate? As such, only a few percent of the population is representing virtually everyone that raids in ICC. Sure, you'll have derelict guilds that have disbanded and haven't been updated in ages, and the good players in them have moved on to other guilds, but that only serves to skew the data in the OTHER direction, making it appear that MORE people are competent at raiding than actually are. "Undergeared is not to be used a way to say "LOL GEARSCORE IS TEH SUX". Gevlon is not pugging. He's found competent people to raid with. As a PuG raid leader I assume that every person I invite is a complete drooling moron even if they have a high GS, the achievement, ect. PuG raid leaders like me know that a high GS is no guarantee that you're any good at your role. But we do know that better gear gives us higher chances of success. This is rational thinking. If you're still angry because you keep getting rejected by PuGs than you have to options: start your own raids or join a guild." What you're really saying is you rather have high GS players who craps out at 2K dps then, picking up a 4000 GS player who can break 7K dps. You're not looking for the best player available you're looking for the lowest acceptable dps you think you need. Or to put it simply you judge books by their covers. I'm in a once-weekly raiding guild. We typically do just the weekly then maybe VoA (never downed the final boss) or Ulduar and then just devolve into heroics. We're kind of low key, in other words. Hell, we're an M&S guild. We finally got into ICC to get some Ashen Verdict (with some considerable pleading by a few of us) a few weeks ago. Did fine, had fun. But, we're obviously dragging down the curve. Last night my guild took the night off, & I got into my first ICC PUG (trash only). Now that I'd at least done the fights, I felt I wouldn't hamper a PUG too much. There was the usual GS inspecting and e-peening that I read about (I rarely PUG). I was truly worried that they would drop me with my 5007 GS and no achievements of any import. I was #2 on DPS. By a lot. I couldn't believe it. Everybody had greater than 5K GS, some near 6K. I hadn't even picked up my first tier 10 piece, yet. And I did some fancy trapping/misdirecting on a few poor pulls. I agree the barriers to PUGing are idiotic. The "skill level" in this game is really all over the board. It just takes a bit of time and energy and planning to play well. If I had more time to play, I'd see how long it takes to get into an actual ICC PUG without having done any of the bosses. But if you're interested in another project (how long does it really take for skilled(?) but non-achiever players to get into an ICC PUG? ), I'm in. Could even gimp my GS to 4800. I have two points to make here. Second, I remain a nay-sayer, not because I doubt your ability to down the Lich King, or the audience you've targeted, both of which things I've already said I'm in agreement about. What I doubt is your simple ability to reach that audience. If you're trying to prove something to the lowest of the low when it comes to raiding, how do you intend to actually do it? Simply downing the Lich King and spreading the information around isn't likely to accomplish much. How are you going to address the fact that most social players are just going to say something like 'Oh wow, you guys are awesome, but it took you a long time and I'm just playing for fun, I don't want to do something so hard' and just go back to what they're doing? Basically what I'm saying is that you're setting a wonderful example, but the people you're trying to set it for are chronically uncaring. I don't think anyone is questioning wowprogress too much, it appears to be largely accurate. The big dispute is over Gevlon's conclusion that 80% of wow players cannot down Marrowgar. You say not to say that WoWProgress is inaccurate, but it is. My guild isn't listed. My main character apparently hasn't done anything since March 2009. Why? we never felt there was any reason to ask them to track us, so we aren't. The big dispute is over Gevlon's conclusion that 80% of wow players cannot down Marrowgar." I think 80 percent is about right. Considering the crossover of 10 man / 25 man raids and the same skilled players bringing alts in on pugs, it may actually be MUCH higher. If you remove the small percentage of people propping the 80% up, then yes, I think if they even get to Marrowgar, it will be brutal wipe after brutal wipe. But that's not how it works. There are guilds fielding effective, skilled teams.... these people are almost all doing Heroic ICC at this time. This is a TINY percentage of total players. Below that is a HUGE mass of guilds still on normal content. In every one of those guilds, a few skilled players allow the team to down a few bosses each week.... up to 11. Remove those skilled players from the normal content guilds, and you guarantee that the rest of the guild cannot do Marrowgar on their own. "What you're really saying is you rather have high GS players who craps out at 2K dps then, picking up a 4000 GS player who can break 7K dps." Oh please, cut the crap 'But there's diamonds in them thar dirt' argumentation. First point. There was a thread on the wow-forums, which went by largely ignored, who proved with a satisfactory degree of statistical accuracy that high GS likely translates to higher DPS. Is it, or is it not rational to assume that GS is statistically unlinked to skill? If so, is it or is it not true that you're as likely to get crap players with high GS as it is to get crap players with low GS? And is it or is it not true that GS measures potential? Q.E.D. The comparison between high GS crap player and low GS good player is simply an informal fallacy, simply because there's no reliable way of separating 'good players' from 'crap players' a priori. Yes, I judge books by their cover. When I have to pick between two books of which I know nothing about, and I have no time (or no means) to read reviews of them, I pick the prettier one. At the very least, it would look good in the library. @ anon "You're not looking for the best player available you're looking for the lowest acceptable dps you think you need." Yep absoultely. If I know the player from Toc10 raids/my guild or whatever I already invited them if I know they can do the job. When I am pugging my holes I am looking for players who wont wipe my raid. GS is bad for people making bad decisions based on GS. Too many tanks carrying Corpse Tongue Coin into ICC makes me shudder. But hey, it's higher GS. By all means slap on crap gear as long as your GS improves. I can only assume you have retribution paladins slotting in an Armour Penetration trinket for the same reason. As a pugging raidleader I KNOW that half the raid will show up improperly geared (to some extent) because they're padding out their GS with idiot slots. The purpose of our podcast on gearscore is not to say "LOL GEARSCORE IS TEH SUX". Gear matters, it always will matter. One of the things we are discussing is how gearscore is not EVERYTHING. It's not just PuGs infected with the GS virus. It's pervasive in guilds with their regular members, too. My former guild (that I left for various reasons) was OBSESSED with gearscore. Everybody, that is, BUT the raid leader (figure that one out). He was taking me into content as a holy paladin to heal him as the main tank that no PuG would have taken me in. Half the guild threw a fit when they realized how bad my gear really was. When I say bad, I was mainly in iLvl 200 blues and one or two pieces of badge gear healing ToC 10. We had little choice, though. The same people pissy about my GS refused to do lower level content that would have gotten not only myself some better gear, but other new 80's who were joining us to raid, too. I actually understand why people who are compelled to PuG, for whatever reason they must PuG, look at gearscores. I really do. It just amuses and mystifies me to see people asking for gearscores that FAR outstrip some of the content they are PuGging for, when they aren't going for hardmode/achievement runs. If a tank would be so dire to use Corpse-Tongue Coin over say, The Black Heart, what makes you think that if he were lower geared he'd choose the Essence of Gossamer over Sapphiron's parry trinket? A bad player is bad at all levels of gear. You can't seriously come and tell me with a straight face that as their average ilevel improves, players' skill becomes worse. In fact, I hope I misread your statement. I really hope that. a) Assuming equal skill distribution in all gear brackets, a higher average raidwide gearlevel guarantees the presence of BRUTE FORCE where FINESSE is absent. Since you can't gauge finesse a priori, aiming for the highest possible gear threshold is absolutely rational. b) If the raid has higher average ilevel means that the raidleader gets less competition on items he(or his friends) desire. Again, a perfectly rational choice. c)Empiric evidence suggests that PuG raids that ask for GS are more successful that those that don't. Empiric evidence is what it is, and must be taken with a grain of salt, but Occam's Razor applies. GS is not present because of a mass conspiracy against 'undergeared' players. It is present because it WORKS. Of course I'm not proposing that increasing ilevels devalue the skill of players. What I AM saying is that too many players, raidleaders included, overvalue GS to the extent that they prefer subpar equipment only because it has a higher ilevel. And.... this is news, how? I saw the same mistake in early WOTLK.